Kyle Long’s 1966 Volvo 122S wagon would be cool enough on its own, given that he swapped in the more modern five-cylinder engine from a 1995 Volvo 850. The week after finishing it, he took his freshly swapped wagon on a 7,000-mile cross-country road trip, where he’s well on his way to legendary status after already having to swap an engine and transmission just to keep going. The finished Volvo en route across America, next to the Toyota Corona Mark II that also came on the trip. Long’s father owns a white Volvo 122S coupe with red vinyl interior, which inspired Long to get a classic Volvo of his own, except with his own spin on it. Long was in college at the time, and his white 122S wagon came up for sale on the Turbobricks forums for just $300. The only problem was that the wagon was in Texas, and Long was going to college in North Carolina. Fortunately, the seller was willing to meet Long halfway in Alabama to hand off the car, as he had grown up riding dirt bikes around the Volvo as a kid. It had been sitting in a field by his house for nearly his whole life, so he was rather sentimental about the old car. Most people who expressed interest in the Volvo just wanted to scrap it. The Volvo as it arrived. The B18 that came with the car. The mess inside Kyle’s new purchase. Long was glad the man was willing to tow it up from Texas (on a car dolly behind a Ford Explorer, which popped a tire en route, no less) so Long gave the seller a couple hundred extra in gas money on top of the $300 for his troubles. To say the Volvo was rough when it arrived would be the understatement of the year. So, it sat under an old tobacco barn on Long’s parents’ property for seven years as he slowly started accumulating parts (including a whole green parts car, which had some key body pieces he needed). The car barely moved until last year, when Long finally got his own shop together and decided to tackle the Volvo. 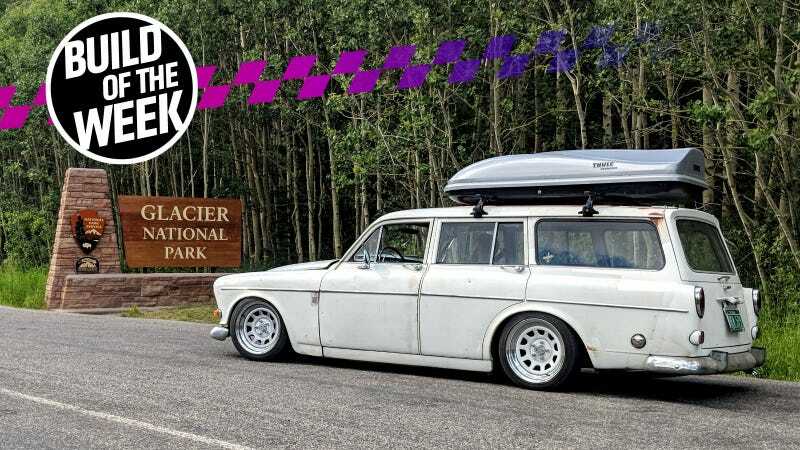 He had the brilliant idea of going on a cross-country road trip with a friend who had a 22R-E-swapped 1970 Toyota Corona around July 4, so he needed to get this Volvo wagon done fast. First and foremost, he had to repair the messy, filler-ridden “repairs” made by previous owners. Rear quarter panels from the parts wagon were welded on in place of the previously sideswiped set that came with the car, a rear tailgate from the parts wagon went on, crash damage in the car’s substructure was fixed, a janky trailer hitch was removed, and the rear floors were replaced. A chunk of the green Volvo was also welded in to repair a hole under the rear driver’s-side window. Long just sanded the new parts all down and used white Dupli-Color rattle cans to paint them to match for now. A shop 2x4 was used to hammer the grille straight. Long’s patchwork Volvo in progress. Naturally, the wagon kept dropping presents on the ground as he gradually fixed up the metalwork and cleaned up the car after years of sitting outside. Fitting the new 850-sourced engine in the engine bay. The Volvo came with the B18 engine from a PV544 and an okay set of carbs which fired up just fine, but Long wanted more. So, the Volvo received a newer five-cylinder engine from a 1995 Volvo 850, but Long left it naturally aspirated because he liked the sound. It was an almost perfect fit, save for some transmission tunnel mods. The new Volvo 850-sourced inline-five engine with those shiny ITBs. A view underneath the car, showing the new transmission and engine in place. A long tube, equal-length header and five individual throttle bodies from a Suzuki GSX-R 1000 were added to maximize the good noises. No one made bolt-up manifolds to use motorcycle ITBs on a Volvo engine, though, so Long fabricated his own. Long used a Megasquirt MS3Pro electronic fuel injection system, as he was familiar with it. A Griffin radiator that had been passed down through multiple Turbobricks forum members was used up front as it was the best one he could find that fit the space he needed it to. Power was fed into a T5 transmission from a Ford Mustang that used a clutch disk from California Custom Clutches. A new Tilton forged aluminum pedal box was added in to go with the new engine, as the stock set would have been too close to the transmission tunnel. This new pedal box also allowed him to located the master cylinders inside the car, which helped free up some space in the engine bay for the new swap. It also let him adjust brake bias and pedal position to where he wanted. Likewise, space concerns convinced him to use a smaller alternator from a 1998 Jeep Cherokee so it wouldn’t block access to other parts in the engine bay. The driver’s side engine mount was completely custom-made from 3/16" steel plate to accommodate this new alternator and other changes. Inside the fuel tank, baffles and an Aeromotive stealth pump were added inside. The fuel pump from a 1992 Honda Civic fuel pump hanger was adapted to fit inside the Volvo’s relatively shallow tank. Shiny new brakes, ready to go. The rear end of the wagon was swapped for one from “the world’s nastiest” Volvo P1800ES sports car. The 4:30 gears that came in the rear end were a bit much, and the carrier in the rear end had just spun a bearing, so in went a new set of 4:10 gears. The new rear end, all cleaned up and ready to go. A new transmission tunnel was mostly donated from that Volvo P1800ES sports car as it fit the transmission, save for the bell housing. The car also rides on a bag-over-strut setup from Air Lift Performance for maximum adjustable lowness, and for the ability to level out loads when he uses the wagon as, well, a wagon. A test fit of its lowest setting showed that the car hit its frame rails and the trunk hit the ground first. Ride height for driving will be two to three inches higher. Cuts were made in the floorboard to allow that low of a ride height to work. He intended to use a universal Ridetech 4-link suspension kit in the rear to triaugulate everything for really low fender clearances, but the only bracket that ended up using were the lower ones. The rest he had to fabricate himself or use stock. Long kept the stock suspension geometry up front, but had to fabricate taller shock mounts for the ride height he wanted. 1966 bracket (left) vs. 1967 bracket (right). Another mild oops happened when he ordered 1967 polyurethane sway bar bushings and brackets without realizing that Volvo changed the brackets between 1966 and 1967. Speaking from personal experience trying to figure out what to order for an assortment of Porsche 944 sway bars from a couple different model years, these tiny year-to-year (and sometimes mid-year) changes are maddening, and it’s way too easy to order the wrong thing. I can appreciate Long’s solution of just figuring out how to use the mounts that arrived because the later mounts were stronger anyway. Inside the car, the seats were taken down to the frame and completely re-webbed underneath with fresh rubber bands. A stylized digital gauge went in place of his old analog unit. A new oil temp and pressure gauge went on the car as well. One mostly finished engine bay. The car finally got put on its wheels in April, mere months before it was supposed to travel across the country in July. From there, the transmission got rebuilt, and the clutch and engine were installed for the last time—or so he hoped. There were some minor things he found to sort as the car came together: some bump steer from bent steering arms, an alignment, a baffle for the oil pan and fresh paint on the cluster face. It was finished the Saturday before Long and his friend Travis McBride embarked upon a 7,000-mile tour of national parks across the country, which started in North Carolina on July 1. McBride’s Corona, next to the Volvo. McBride took his 1970 Toyota Corona Mark II, which has a similar backstory as the Volvo. The Corona had been in the family for a while and was nearly bound for the crusher, but he got it for free, fixed it up and swapped in a more modern, fuel-injected 22R-E inline-four Toyota engine. It’s been finished for a few years now, so it’s definitely the reliable one of the two. “We’ve only destroyed one engine and transmission so far, and fixed a few massive fuel leaks,” said Long via email. Only. That broken engine and transmission both came from Long’s Volvo. The Volvo made it to West Virginia before the crew discovered low compression on cylinders three and five. Then the tail shaft bushing fell out of the rear of the transmission. The Volvo was trailered home to get a new engine swapped in from the junkyard, and the transmission fixed over the next two to three days. Long had to swap all of the custom parts off the old engine and get a new pilot bearing made, which ate up extra time, but then they immediately got back on the road on July 4. “I think [the Corona has] carried me to the parts store in six states now,” Long said via email. Long had to replace an alternator in Wyoming on July 8, and a major fuel leak had to be repaired on July 9, and then Long had to overnight a new rear air bag after blowing one of his on July 10. That left them stuck in Montana’s beautiful Glacier National Park for a little longer, so I can’t imagine it was the worst. While the Corona has been the most reliable wagon on this trip, it also has a tendency to fall out of fifth gear (which McBride solved with a bungee cord) and had a major fuel sender leak that they fixed on the road. From there, the duo hit up Yellowstone, hiked in the Tetons, and then did an overhaul of the airbag suspension in the Volvo just in case—taking all four out and putting all four back in to make sure they weren’t en route to blowing another one. Sadly, they didn’t make California as planned as they simply ran out of vacation time, but they had a blast touring the Rockies. Long now plans to turn this Volvo into a reliable daily driver, just like his friend’s Corona. The Volvo’s interior is still pretty rough, so that and all the other issues Long encountered on the trip are on his to-do list when he gets home. I think that means it’s time to make fresh red seats happen. All I know is, I’d love to see this thing actually make it out to California to make up for this year’s woes on the road. The roads along the west coast definitely live up to all the hype. You can keep up with the Volvo’s future adventures at its Turbobricks thread here, or on Instagram here.